The Virtual List technique has been around for a few years (created by Bruce Robertson ca. 2009). 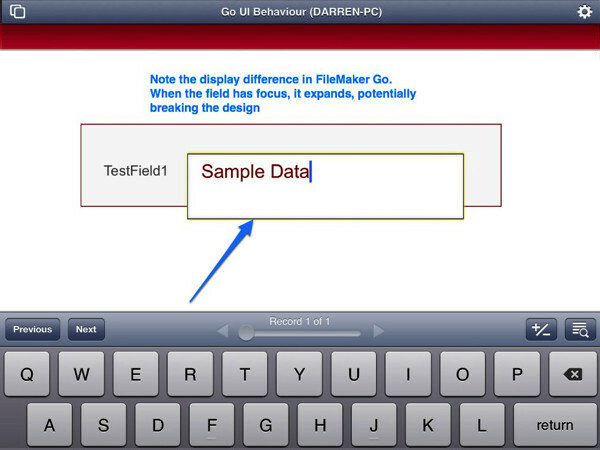 Over time and with changes to FileMaker, implementation of this technique has evolved. 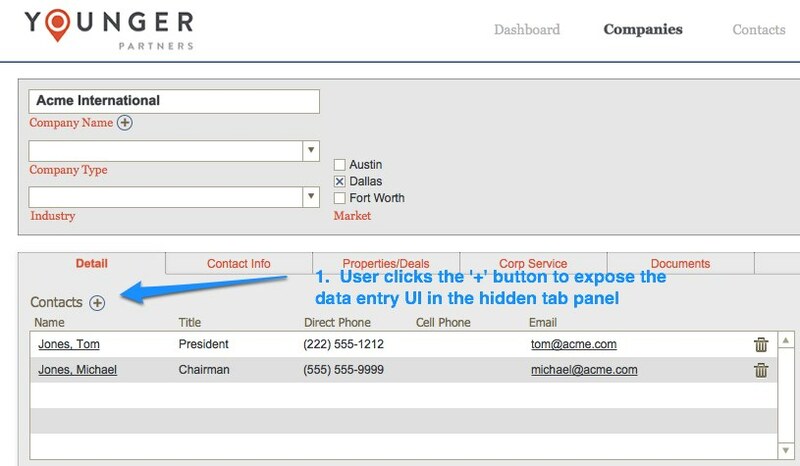 Knowing how to set up and use virtual lists will help with creating certain reports, especially if you draw the values from ExecuteSQL statements in FileMaker Pro 12. Articles (see Lisette Wilson’s Taming the Virtual List, Part I and Part II) and examples are fairly easy to find. So why write another one? Many examples and articles include use-specific cases to illustrate the virtual list. I’m going to attempt to boil this down to three simple steps. Once you draft the basics of this process into a FileMaker file, you can use this as a template for more complex reports. You can re-use the draft as a template, copying the table and script from one solution to another. This technique requires one dedicated reporting table, plus a script to populate some global variables. The fields in the reporting table are set up as calculation fields that get their values from the list within the global variable. To illustrate the process, I added a table to the Contacts Start Solution as a sample database, which you can download here. 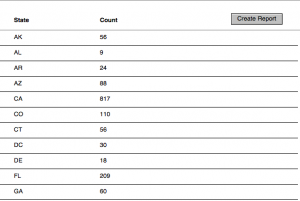 When you visualize the report itself, it usually consists of rows and columns. Each row is a record in the table, and each column corresponds to a field. At minimum, you need two fields. 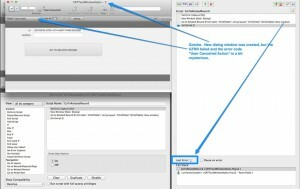 One field is a hidden id field; it’s a crucial component of the report, but is not displayed. The second field appears on the report, and will contain data generated by the script. This simple two column example below could have been created as a SubSummary report. However, the power of the virtual list is that it allows you to combine data from many tables, something not easily within reach by a SubSummary report. In my demo file I have three fields, one for the id and two for the actual column data (state and count). 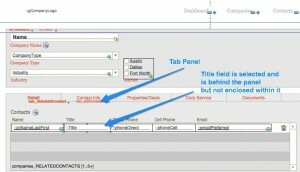 Of the two fields mentioned in the table, the id field governs what shows up in the data field or column. This field is set up as a number, starting at one, with each subsequent record incrementing by one. Most reports will have less than 100 rows, so a general rule of thumb is to just create 100 records (however, if your report demands more rows, just create more records). 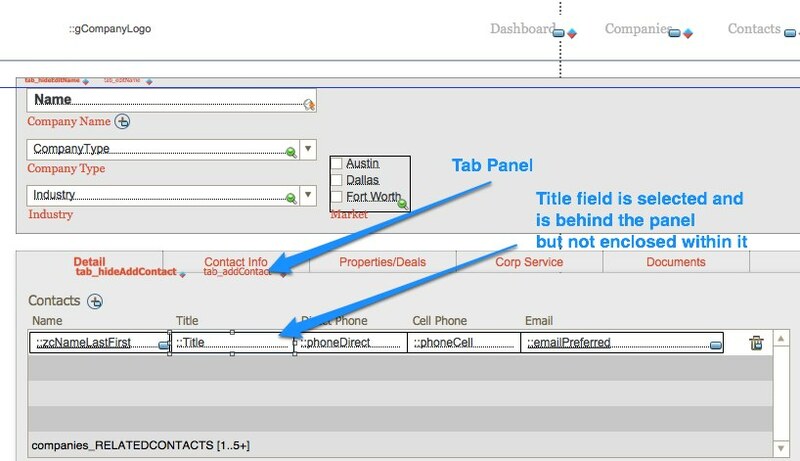 If you create a table view with the report layout, the id field should show 100 rows, with values from 1 through 100. The second field is the first column of the report. Reports can have multiple columns, so new fields are created as needed, using the same principle. To keep it generic, in my report template I simply named the fields “column1” and “column2” and set them up as text fields. If you need to format data as numeric values, i.e. $43,000.00, this can be done with text formatting functions. The column field is set up as an unstored calculation: GetValue ( $$COLUMN1 ; id ). This will make more sense after Step 3, the script that creates the $$COLUMN1 global variable. Before the $$COLUMN1 variable exists, the “column1” field has no value. Once the variable is created, the field calculates from the content of $$COLUMN1, which is a list, and extracts the value that corresponds to the id number for that row. This is the magical part of the virtual list technique. This list has five values. For the first five records, as indicated by the values 1 through 5 in the id field, the GetValue() function will pull the corresponding fruit into the “column1” field. This loop will fill in the first column values with numbers, by virtue of the GetValue function. 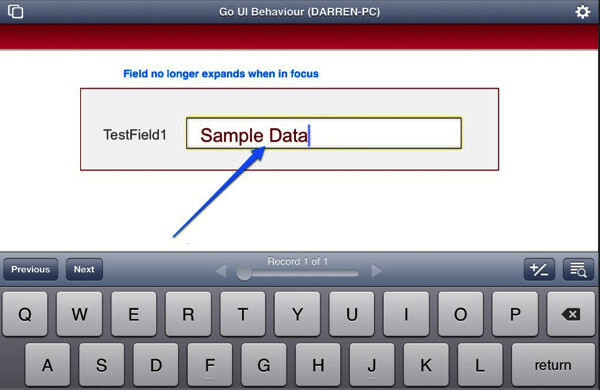 To fill in your report with real values, change the “Set Variable” line to something real. 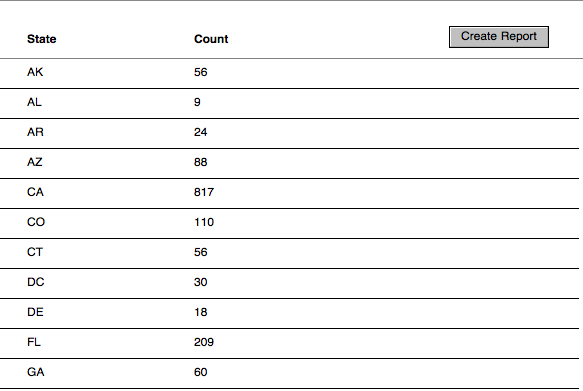 In the ContactsVL database, I wanted a count of people living in each state. I created a variable with all the states, and looped through this list. I then ran an SQL query inside the loop for each state. In another example, rather than a list you can loop through, you have an individual requirement for the report, with text for report sub-heads. Here it’s just a matter of stepping through each row and setting the variable $$COLUMNx with the result. By adding values to a growing list, you then can parse this list into the rows of the reporting table. And for the subheads you can use text formatting functions to add bold and increase the font size to make these stand out. Once you have set up a reporting table as in steps one and two, this technique can be used for many different kinds of reports. With a simple starter reporting table and a script or two ready in a template, you can quickly expand this concept to specific solutions. 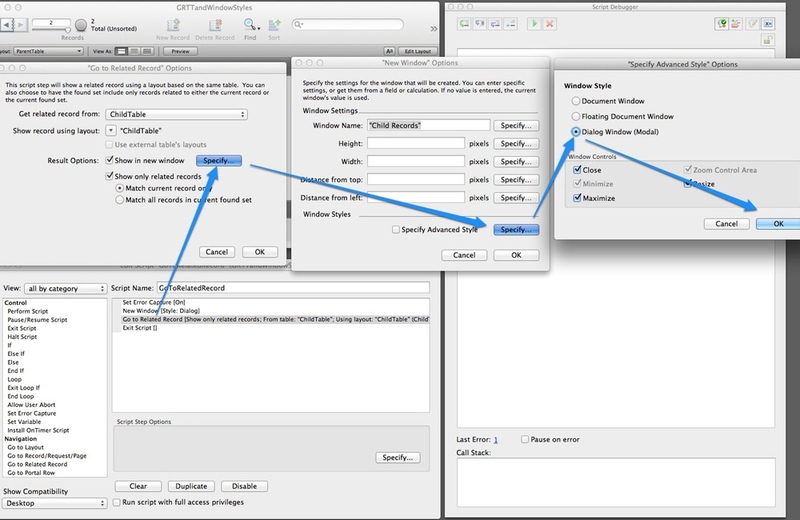 Here is small development gotcha regarding FileMaker 12 advanced window styles. If you create modal dialog window, and then execute a Go To Related Record (GTRR), creating a new window from the modal dialog, the window style of the new window must also have an advanced style set to modal dialog. You might want to do something like this if you present a modal dialog to the user and then need perform some off-screen processing in a new window after the user performs an action in the dialog. 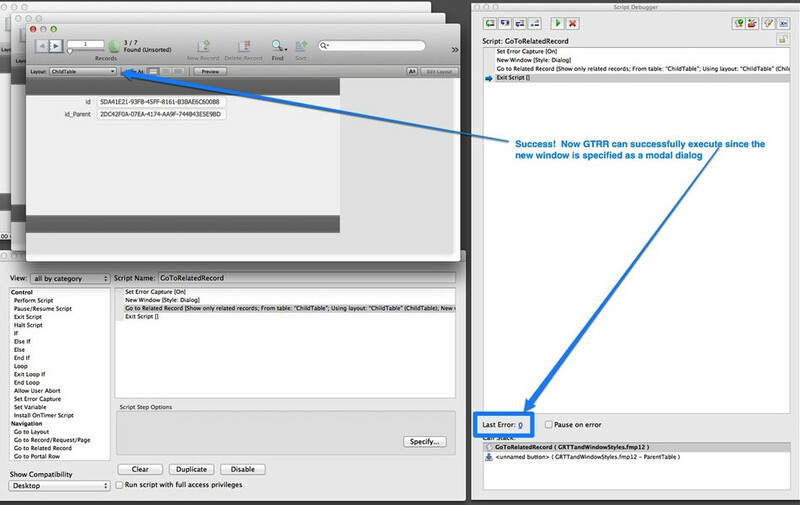 If the new window is not set properly as a modal dialog, the GTRR script step returns an error 1 (User Canceled Action) and the GTRR does not occur. Seems to me this error message does not clearly lead to an understanding of the actual cause of the error, hence the gotcha. Any operations that attempt to open a non-dialog window will fail when a dialog window is open (for example, using a script trigger to run a script from another file). 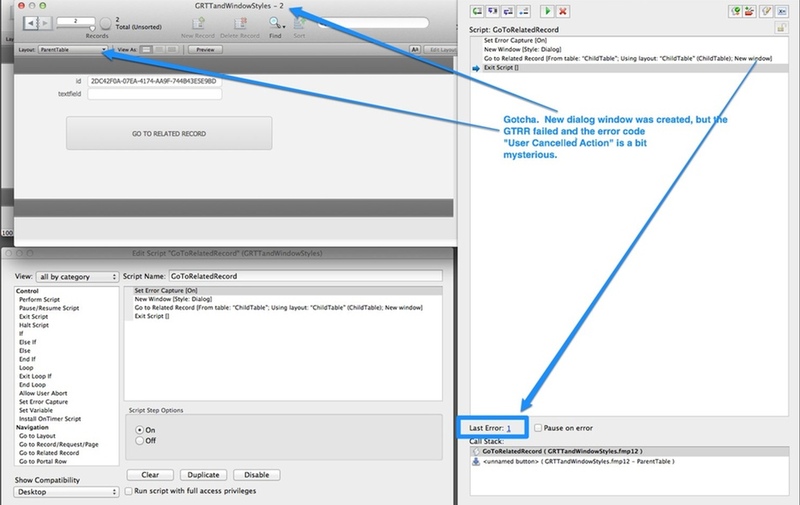 OnTimer scripts do not execute when a dialog window is open unless the script launches from the dialog window itself. Intuit’s QuickBooks software organizes business information: contacts, vendors, orders, invoices, inventory, and more. Many small businesses use QuickBooks as their back-end accounting software, alongside FileMaker. Often these two applications perform separate functions, but sometimes there may be a need to integrate them. I’m going to briefly discuss one such method, using the FM Books Connector plugin (FMBC) from Productive Computing, Inc.
FMBC runs only on Windows. You need to have QuickBooks, install the plugin into the directory FileMaker uses for plugins, and run a couple of installers that allow for XML communication via QuickBooks. Again, PCI has step by step instructions for this process, along with a sample database that will test each required piece. 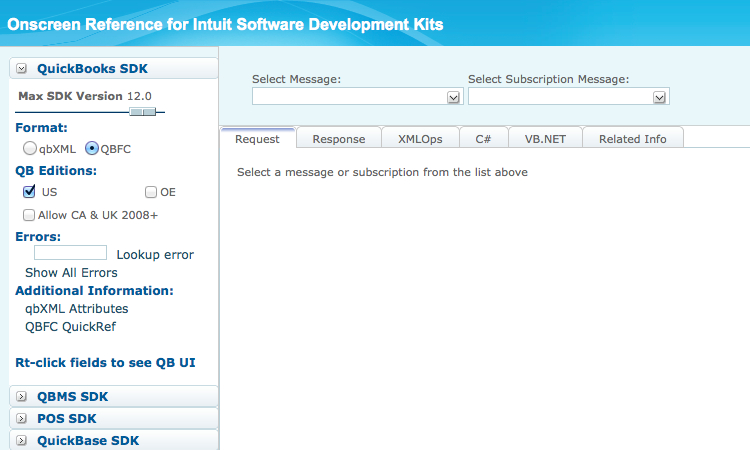 QuickBooks needs to be up and running when you make your queries, edits, and new record requests from FileMaker. Finally, the plugin needs to be registered, or it can run in demo mode for 30 days, though you will run into time-out issues while in demo mode. All requests from FileMaker to QuickBooks are made through function calls from FMBC. These function calls are contained in scripts, and at the very basic, contain steps to open the connection, send data, return a result, and close the connection. Exactly what takes place in the “send data” part depends on your action, and any data returned may include confirmation, content from QuickBooks, or an error message. FMBC comes with a handy developer’s guide, but this is only half the picture. The other half entails understanding Intuit’s On Screen Reference Manual and deciphering the XML tree. 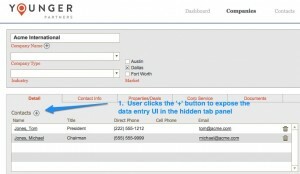 Each action such as adding a customer, adding a sales order, editing a customer, etc., are grouped under Message Types. The key in writing any scripts to query QuickBooks via FMBC is first to outline which message type will be used, and then review the XML for fields in QuickBooks. 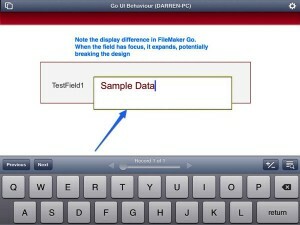 From there, map the QuickBooks’ fields to fields in FileMaker, and use the appropriate function call. 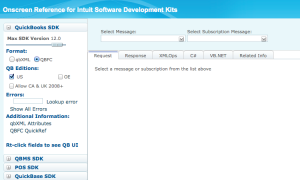 So, adding a customer, for example, requires the “CustomerAdd” message type and the Name. 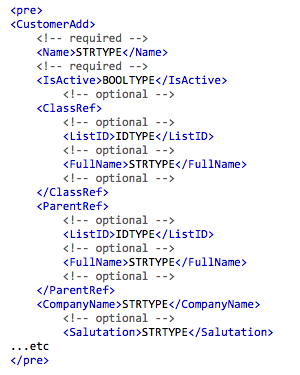 Salutation is an optional value that comes after the CompanyName. Additional fields and values are then added as needed. 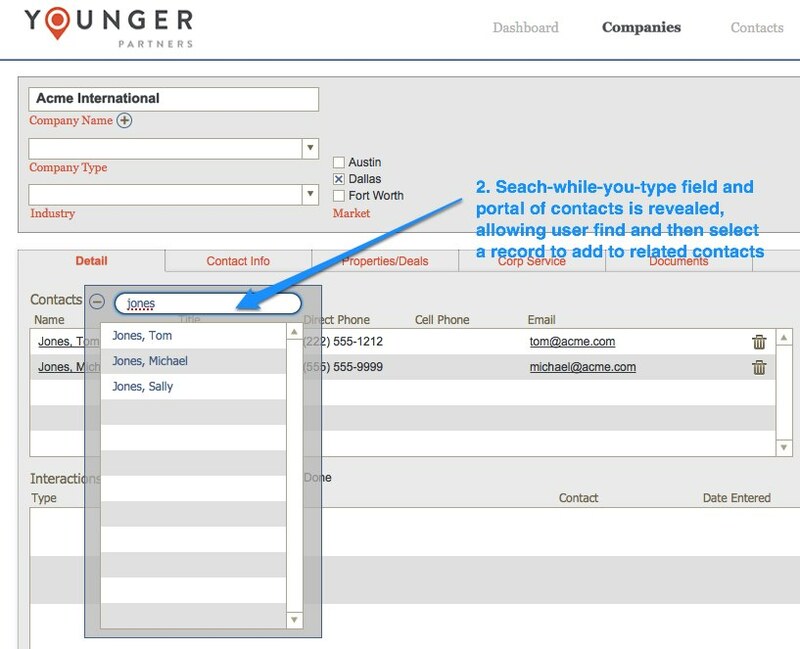 Once you add the various fields you want in your new customer action, you need to deal with the result. You cannot assume the data will be added, so handling errors is critical. 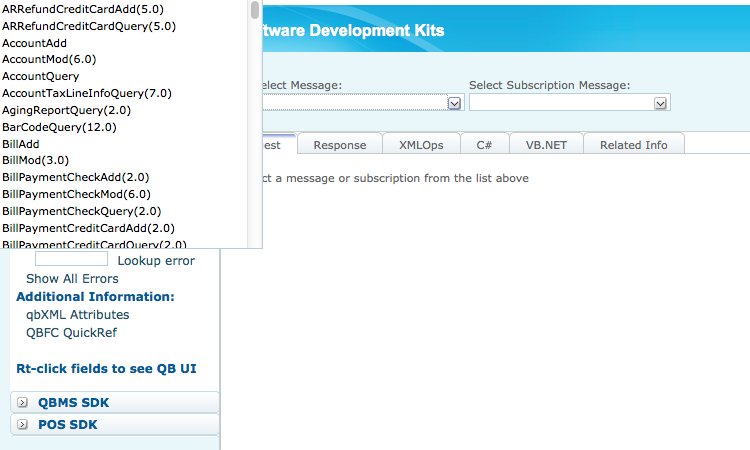 Successful calls via the plugin result in a zero, so checking for this value or !!ERROR!! text when sending the data will indicate whether something is wrong. If an error is detected, FMBC includes a handy function called PCQB_GetStatus that will show the error message. A few of the errors I’ve run into include values expected in the wrong order, the QuickBooks application being unavailable, and certain pre-conditions or values not in place. 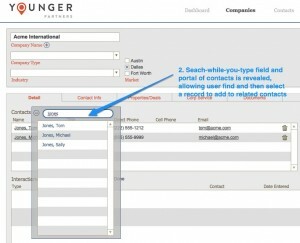 Along with adding records, FMBC lets you add related records, query existing data, and edit data already in QuickBooks. Here are a couple of example “gotchas” to keep in mind. Adding sales orders requires that items already exist in QuickBooks’s Item Inventory table. Certain elements like Terms and Ship Via options will need to exist in QuickBooks when sending over sales order data, if you include these values. This isn’t always spelled out, and must be deciphered from error messages. You will want to make sure updates only are attempted from Windows. So if you run a cross-platform user environment, prevent the scripts from running on the Mac OS using the Get( SystemPlatform ) function. Integrating QuickBooks with your FileMaker solution is quite feasible, but requires careful planning and testing. Once you set up the first few connections and learn how to interpret error messages the process begins to flow more smoothly. An alternative to running each script in debug mode is to create an error table and log any errors there as they occur. Then you can review the table and pin point where the script faltered. Integrating FileMaker and QuickBooks should hopeful reduce data entry (no longer in both places), and allow users a friendly front end method to create and update data, and also to see the data you already have in QuickBooks. Consider team sports. They consist of players on various surfaces and environments (fields, courts, pitches, etc.). The player performs the actions that directly affect whether the team wins or loses. 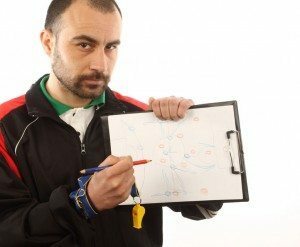 Although not directly involved in the action on the field, virtually every sport includes a coach, someone who comes up with the game plan. Even in individual sports, the athlete who tends to go alone often experiences a jump in performance when consulting with a coach. Competitive runners and swimmers rely on coaches to plan and organize, even though some plans may change in the midst of an event. Even individuals whose careers are not dependent on racing discover that coaching provides unique benefits and insights, even while not making daily use of those services. Sports analogies permeate almost every sphere of our non-sports activities, from work to politics, family to entertainment. In the business world, coaches play similar roles. Whether working alone or in a team environment, there are benefits to having coaches look over your shoulder as you encounter unfamiliar situations or to affirm ideas and defeat doubts. MightyData provides a full-featured range of services around FileMaker Pro, from development through consulting, instructor-led training classes, and coaching. There is often a delicate balance between training and coaching. One might say in the context of FileMaker development (or any software development), that training is the first step on the road to becoming a developer. Basic training focuses on users – people relatively new to the product and from the perspective of a user. Subsequent training, especially in the FileMaker Training Series (FTS), goes far more in-depth and covers development tools and certification requirements. Not every developer seeks certification or even the broad scope of FTS training. Coaching fills this void, targeting specific areas. How do you know if you are ready for coaching? First, you must be motivated to learn. You are not simply handed a fish, but guided in the process of becoming someone who can fish, to cite another analogy. By considering coaching, you acknowledge a thirst for learning and a desire to improve. Coaching is not an admission of defeat, but a validation of your skills and your desire to take them further. A coach may suggest solutions and approaches to problems, but ultimately the implementation and understanding lies with you. Flexibility comes with any coach/developer relationship. As in sports, individuals may clash; sometimes the player refuses to budge, other times, the coach remains set in certain ways and fails to see other options. Both the developer and coach must take an open approach. Another critical skill is communication. How do you articulate the issues or problems? MightyData’s coaching is mainly a virtual affair, conveyed via email and screen sharing using GoToMeeting. Can you state the problem so that others understand both where you are coming from and where you want to go? There is always a goal in mind, so vague generalizations tend to lead to fuzzy coaching as if the coach surveys a dusty nebula of issues, rather than sharp stars. Can you interpret what the coach tries to communicate? Sometimes the coach may assume certain things about the problem and suggest a solution that doesn’t quite fit the problem, and the developer needs to mention this to clarify any misunderstanding. In my experience, I think a coach enjoys giving back knowledge, which is why we coach. We share in the excitement someone feels when he or she has that “aha” moment as something once murky becomes clear, the realization of learning some of the tools FileMaker contains and how they work. If you are looking to take your general FileMaker knowledge to another level, I suggest a broader training curriculum. If you are ready to hone your developer skills and have the willingness to learn and ability to communicate, then you are ready for coaching. Alright. I just had a call with a sales guy trying to sell me on HIS services. He worked for a printing company and asked if we would want his company’s services for printing a FileMaker training manual. I told him thanks, but no thanks. We are a virtual company. We don’t use paper. (You’re welcome, Hippies!) We do our training online and create electronic documents. Being a sales guy myself, I tried to turn the call around on him and sell him on our services to no avail. Oh well. But as I was being talked to by this guy I realized something… hold on a second. Did you hear what I just said? I was being talked to by this guy! The guy knew his script very well. But he just stuck to it. There was no friendly banter or trying to talk to me like I was a regular person. Just him spieling his spiel. Now I did not have this type of conversation with my sales guy call, but it illustrates my point. So here’s a post that taps back into some of my acting training. Learn the script. Learn it inside and out. Then… let it go. We get phone calls from all sorts of people with various positions at companies in various industries. The difference with our products and services is that it fits a very specific need for very specific people. When somebody calls me to talk about his need, it can be completely different from the person that called me 30 minutes prior. So how do you handle so many variables? You learn your script and then get off of it. What does that mean exactly? How do you do that? Well, one of my passions happens to be acting. When doing a scripted play you need to learn the script. The play follows that script so precisely that there are sound and lighting cues that happen because of a particular line that someone says. But, if that person forgets those lines, and it does not cue your line or the lights, there is a little improvisation that needs to happen based on your intimate knowledge of the play, scene, and character. This allows you to cover and get the play back on track should the dreaded brain freeze or technology failure happen. This works in sales as well. Because of the randomness of situations that can come up during a call, you need to be prepared to go with the flow. Get the script on the track that you want, but staying in line with the overall theme of the call. While I lived in L.A. I became friends with an actor that has done some pretty amazing things on film. One time I asked him, “What is the most important thing you can do when going to set to shoot for the day?” He said, “Learn the script, and let it go. It is the only way to be free as an actor.” That really was an important acting lesson. It is true too in sales. If you know your role, your company’s role to a “t”, you can sell to anyone who is willing to buy. Your improvisation skills take the conversation in many different directions… directions that other salespeople may not go. And this is what will set you apart from your competitors. Your ability to connect with the customer is what really makes your customer buy from you. This is what the customer will remember. There are a lot of things that go on during the sales process. You and the customer are trying to see if you are a good fit together. When I qualify a customer, one of the main things I look for is, “Can we build a strong partnership together?” That is what we are doing anyway, joining together to accomplish a goal. We make some money and we create value by helping you become more effective. Another major part of that qualifying stage is trust-building…can we show you in our first couple meetings that you can trust us with your business. I can’t tell you how many times I have heard from a potential customer, “I picked you guys because you called us back first/quickly.” Just the other day I had a potential customer tell me that he had left messages with some of our competitors and they didn’t reach out right away, but he liked us because I called him back within 4 minutes. While this is not a great reason to build a partnership, the reason behind it is. He is really saying that he trusts our word because of our quick response. It is the first stages of building trust with a potential customer. Everyday of your life you deal with many trust tests. Anything from as small as, “Do I trust the driver in the car next to me?”, to something as big as, “Do I trust the food that I am putting into my body?” Trust tests come in many variations and situations. I think one of the most common ones is money. Do I trust the bank? 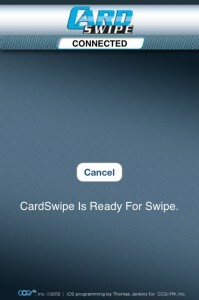 Do I trust the bartender with my credit card? Do I trust this online payment is secure? Does my wife trust me not to blow all our money at the casino? ; ) And finally… do I trust this business with my business (aka, my money)? There are many factors that go into trusting a business with your money. Are they reputable? Do they have a lot of satisfied customers? Are they going to do what they say? And how do you ever find that out with a virtual company such as ours? I mean before you sign your first proposal with us, you have not met us in person. You have not seen that we are actual people. Yet in the world we live in today, this scenario is very common. We go to websites such as eBay, Amazon, and various other retailers, and trust that they have the product that they offer on their webpage, and that they will send it to us. We never talk with anyone about it. We simply click on a picture, add it to our virtual cart, enter our financial information and trust that it will come in a timely manner and in one piece and they won’t steal your identity. Obviously, the main difference with buying from us is that the price point is a bit higher than items you would buy on one of those sites. But another big difference is that this is a purchase you are making that could change the way you do business. And when it’s your business that is involved not just a DVD or HDTV, there are some more things to be considered in the trust exchange. Really more than an exchange of services for money, you are trusting our FileMaker expertise and our understanding of how your business works. We do this in a couple of ways. First, when you contact us, we will get back to you within one business day. You and I will have a conversation about your needs; you will notice something different about us. We are consultants first and developers second. We want to get to know all the ins and outs of your business so that we are advising you from the best position possible. We want to create a partnership and build trust with you from day one. The second way we will build your trust is to conduct discovery. This is a paid engagement, but it is an important early step that we take with about 95% of our customers. It helps you to see how we work, how our whole team comes together to provide you with the best we have to offer. When you have more people to lean on, it makes it easier to rest. There is an old acting exercise to teach you about trust. Your ensemble stands beneath you as you stand on a chair. You must trust them to catch you as you close your eyes, cross your arms and fall back. We ask you to do the same when you sign a Discovery proposal with us. We know you have not met us yet, or seen how we work, but if we have shown you our ability to respond, advise and direct in our first few meetings then hopefully it will give you enough of an idea to trust us more. We are confident you will see our abilities, trust that we can get the development done and make your business run more effortlessly. After all if you don’t trust someone with your best interests why would you want to work with them?